The label network hardware is generally given to any piece of equipment with the task of moving data. A router is a network device with interfaces in multiple networks whose task is to copy packets from one network to another. Routers operate at Layer 3 of the OSI Model, the Network Layer. A router will utilize one or more routing protocols to create a routing table. The router will then use the information in its routing table to make intelligent decisions about what packets to copy to which interface. Routers are available with many interface types, such as Ethernet and DSL. Wireless routers support wireless interfaces, such as 802.11 (Wi-Fi). Not all routers clearly fall into the category of network hardware. Routing softwaremakes it possible to build a fully functional router out of a normal computer. A switch is a network device with multiple ports in one network whose task is to copy frames from one port to another. Switches operate at Layer 2 of the OSI Model, the Data-Link Layer. A switch stores the MAC Address of every device which is connected to it. The switch will then evaluate every frame that passes through it. The switch will examine the destination MAC Address in each frame. Based upon the destination MAC Address, the switch will then decide which port to copy the frame to. If the switch does not recognize the MAC Address, it will not know which port to copy the frame to. When that happens, the switch will broadcast the frame to all of its ports. Before switches became available, devices called hubs were used. Hubs were less intelligent netword devices that always copied all frames to all ports. By only copying frames to the destination ports, switches utilize network bandwidth much more effectively than hubs did. Another piece of network hardware related to the switch is the Bridge. A Bridge is effectively a two-port switch. Because few users need a two-port switch, they are no longer manufactured. A network interface card is an expansion card which installs into a computer and enables that computer to physically connect to a local area network. The most common form of network interface card in current use is the Ethernet card. Other types of network interface cards include wireless network interface cards and Token Ring network interface cards. 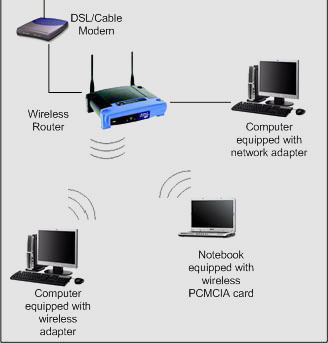 Other terms for network interface card include network adapter, network card and NIC. Network interface cards are becoming rare, as most motherboards now include built-in network interfaces.